Orange today announced a partnership with Twitter, which will enable customers to send photos to Twitter via MMS (multimedia text messages). 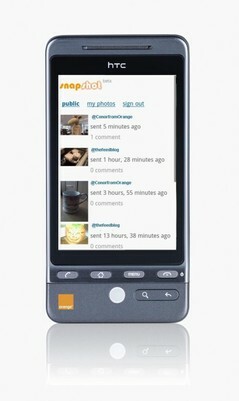 The service is called snapshot and is only available to UK Orange users. Orange also say that they will let their customers send and receive Twitter updates directly from their mobile phones using text messaging. This isn’t particularly significant as it has always been possible to send Twitter updates over text, though the alerts function is new, and it might make the text update process easier. This development isn’t very relevant to anyone with an internet-ennabled smartphone, because they can already do those things over apps or their internet connection. But it does open up Twitter to the many people who own standard phones without apps or good internet interfaces. Twitter alerts will be available free, with upload text messages either included in customers’ bundles or charged at the usual rate. Users can set the alerts they want to receive. Orange suggests that you’ll be: “able to choose to receive text message updates on ‘tweets’ from all people they follow, individual users or direct messages. They’ll also be able to set times for receiving ‘tweets'”. Receiving a text everytime someone you follow sent a tweet would be horrendous but @replies would be fine. Text messages and tweets have always been closely related so this makes sense for Orange and could bring a whole new raft of people onto Twitter. Fingertips v Netvibes: which personalised news site is better?